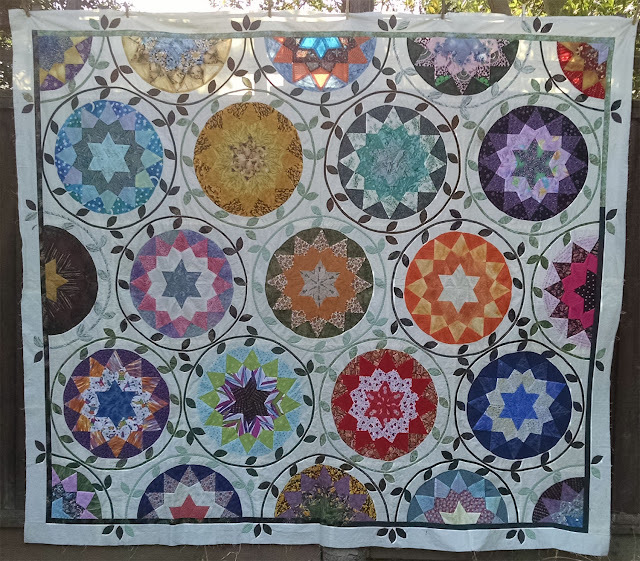 I am pleased to share that I have FINISHED all the Stash Busting Stars that I needed for my top and then augmented the layout with some leaves and vines. I started the first hand-pieced star in September 2016 and finished the last hand-appliqued leaf in February 2018. The blocks themselves are machine-pieced together. You see, waaaaay back in 2001 I bought a quilter's calendar. 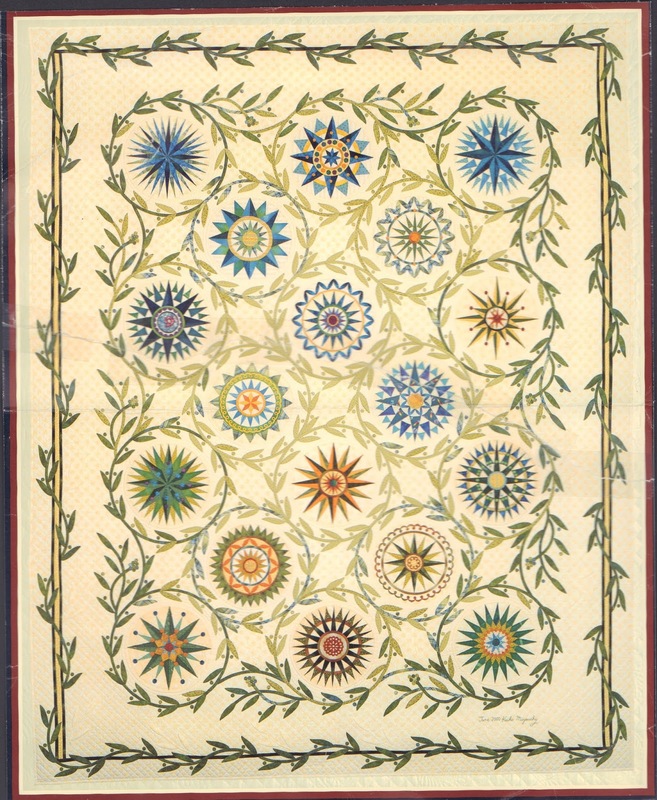 Each month had an awe inspiring quilt from a master quilter. One month truly took my breath away and when the year was over, I saved that one page for the day when I might use it as inspiration. Well, finally, that day had arrived. I KNEW the minute I saw Esther's stars that the intertwining vines and leaves would be PERFECT for the setting of Esther's stars. 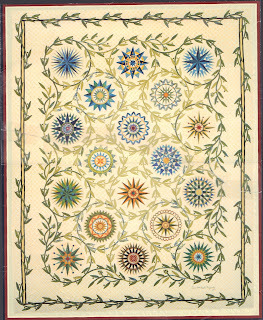 The quilt on that calendar page was made by Keiko Miyauchy. I had deferred the background fabric until I had made all the stars. I wanted to let them tell me what would look good. And they did. I chose a soft pastel yellow .. a color that I normally don't use at all .. but it just seemed to work well with all the colors in the stars. I had found a lovely white tone-on-tone fabric "someplace" and used Rit dye to color it that soft yellow. The overall look-and-feel of the fabric is a very subtle pastel yellow but upon closer inspection, you can see the tone-on-tone design. It came out perfectly. Except for the binding! I had JUST enough of the tone-on-tone that I had dyed myself for the background fabric but not enough to make the binding. However, I wasn't concerned because I have a magic card up my sleeve! To get the amount of yardage that I needed for the binding in the precise shade I wanted, I used the excellent services of Tammy Salzman, "Always Unique Hand Dyed Fabric". I've used Tammy before to get the most luscious hand-dyed fabric for my appliques and have never been disappointed in the quality of her fabrics. I sent Tammy a swatch of my dyed fabric and .. as I knew she would .. she matched it EXACTLY. I am simply delighted. I appliqued all the stars onto the background yellow but instead of using squares as the background shape, I intentionally used rectangles, so I would have room for my vines and leaves. 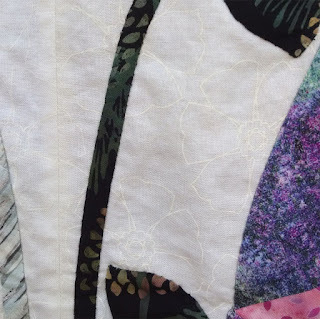 Once the rectangles of stars were sewn together into a HUGE top, then I began applying the bias binding vines and making the double-pointed leaves. OH MY GOSH, I quickly became SO BORED with vines and leaves! There were a gazillion of them! Remember my inspiration photo? Well, Keiko Miyauchy is a saint. There was absolutely NO WAY that I could have EVER replicated her intricate design. I was having enough trouble slogging through my pared down version! So, my own version is a very simplified version of Keiko's. My rationale is that I figured that I could actually FINISH my version, whereas the time required for hers was waaaaay beyond what I wanted to devote to this project! 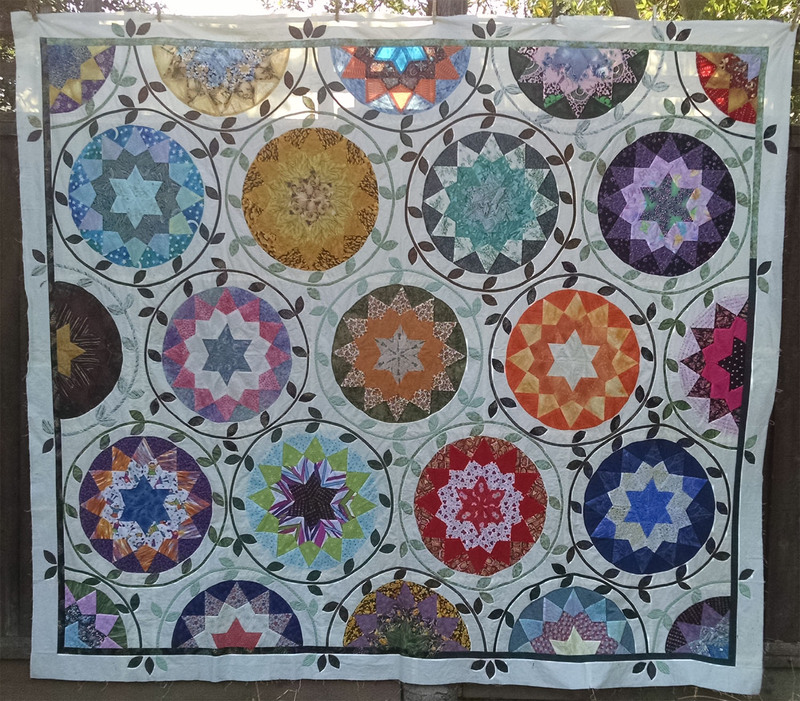 Here is my finished top .. it measures 90" x 102". It looks amazing! I am having blogging blahs as well. I really need to up my game. Just add your top to tbe group until you have just the right idea for the quilting. I have recently pulled out many of my tops and have them hanging on hangers where I can see them. I will quilt them as I have ideas. Nice to have you blogging again, Shelley! And what a masterpiece to come back with. Beautiful top!